What is the most unlikely things a tennis player would do during the break between sets? But that's what exactly Kei Nishikori did during the two-and-half hours marathon match against world no. 4 David Ferrer. Kei, who had just dropped two straight sets against Ferrer, pulled out a small red and blue book out of his gym bag and started to read. Very typical Japanese, isn't it? "I was reading about what I should do in the match," he explained. "Such as stay calm. And don't get pissed off too much." Kei took the words to heart, beating Ferrer 6-4, 6-4, 3-6, 2-6, 7-5 in a thriller to become the first Japanese man in the modern era to reach the round of 16 at the US Open. 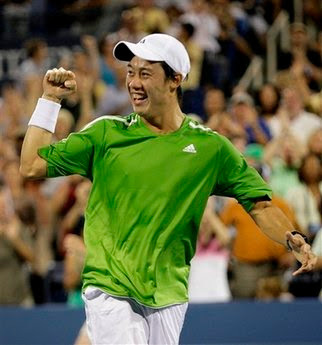 "I still can't believe it," said Nishikori of the three-hour, 25-minute match against the 2007 US Open semi-finalist. "I was playing great. This is the biggest win for me." After squandering a two-set lead, Nishikori, who is ranked 126th in the world, stepped it up in the fifth set, clinching the victory on his third match point. By reaching the fourth round, he surpassed countrymen Jun Kamiwazumi (1973) and Toshiro Sakai (1971), who advanced to the third round of the US Open before being eliminated. 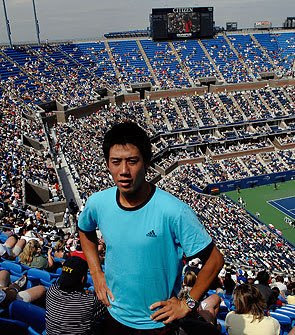 "I never think about it," Nishikori said of his historic run at Flushing Meadows. "That I am making history or something. But I know Shuzo made the quarters of Wimbledon." "I was tired and my legs were almost cramping," he said. "But I tried to tell myself that I am playing David and he's number four in the world. That made me feel kind of happy and think more positive. I was tired too so I just tried to fight in the fifth set." 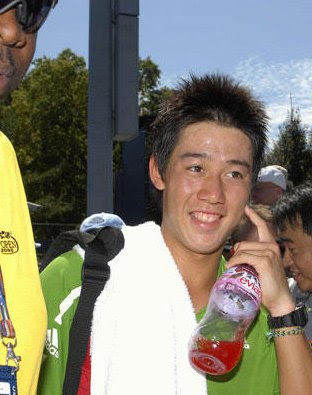 Nishikori has trained for the past five years at the Bollettieri Academy in Florida after arriving in the United States without his family as a 13-year-old. "I had two friends come with me," he said. "I couldn't speak English. I was so nervous. I was scared of everything, all the American people. "But now it is fine." The unseeded Nishikori will next face Juan Martin Del Potro, who comes into the fourth round riding a 22-match win streak. Gambatte, Kei-san!